Buyers agent fees vary depending on the amount of work involved, the project’s scope and the degree of difficulty or lack of it of your project. For example, the buyers agent fees to bid at auction is less than using our property search full service. Remember you’re paying an exclusive buyers agent fees to search specifically for you and to be completely independent and impartial. This is different to the service some selling agents offer where they have in-house ‘buyer’s helpers’ that assist you to buy properties their colleagues are being paid to sell or other agents’ listed properties. A professional buyers agent is completely independent and impartial, working exclusively for you, so when considering these fees, remember what you are paying for. A buyers agent will save you significant time and stress in sourcing appropriate properties and, as skilled negotiators, they are likely to save money on the eventual purchase price. You can also rely on us to objectively evaluate the pros and cons of every property without the emotion that you may otherwise experience. In short, an exclusive buyer’s agent is on your side. 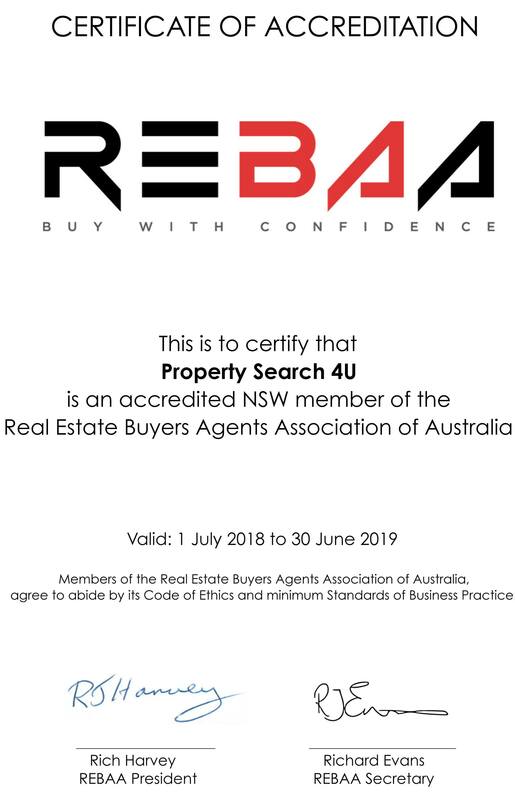 The general industry guidelines for buyers agent fees can be found on Real Estate Buyers Agents Association of Australia (REBAA) of which Property Search 4U is an active member. Our negotiation processes and skills will deliver actual savings which may be greater than our buyers agent fees. At Property Search 4U we charge a fixed fee based on location, property specifications and price. Property Search 4U will implement the selected service to achieve your property objective. If you are not totally satisfied with the progress of our service, we guarantee to refund you 100% of the initial fee within one month from the date of its payment. To effect the refund, we will ask you to write us with the reason of your dissatisfaction and we will refund your money without any further obligation. Your buyers agent must be an independent licensed real estate agent working exclusively for you on a full time basis, providing you with market knowledge, negotiating skills and savings both financial as well as valuable time, at all times helping you avoid stress, frustration and indecision. To hold a current professional indemnity insurance policy. The NSW Government introduced a new regulation effective 1st January 2013 whereby it is mandatory for a buyers agent to hold a current professional indemnity insurance. For full details, visit Property, Stock and Business Agents Amendment (Professional Indemnity Insurance) Regulation 2012. All licensees are required to hold current professional indemnity insurance appropriate for the industry to a minimum of $2,000,000 in the aggregate. Insurance is only required if the licensee engages in the activities for which the licence is required under the Property, Stock and Business Agents Act 2002. The policy must cover certain insurable events such as negligence, misleading or deceptive conduct, breach of professional duty, interference with intellectual property rights, and fraud or dishonesty by an employee.